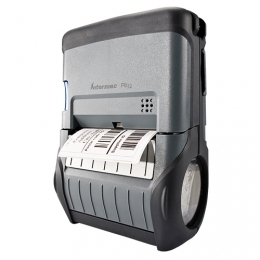 The PB32 thermal direct mobile printer from Honeywell may be used flexibly to print labels as well as receipts. This way, you cover multiple applications with just a single device. Its high print speed of up to 102 mm per second at 203 dpi secures user productivity at all times. Thanks to corresponding sensors you reduce printer errors, plus central device management via SmartSystems ensures for maximum operation times. Media change occurs quickly using the lid on the top. The PB32 impresses with its robust, IP54-certified housing in all demanding environments, such as warehouses, logistics and in retail. Thanks to both vibration and impact protection you may also use it in a forklift, with the accompanying vehicle mount. Temperatures changes ranging from -15 to 50C and repeated drops from heights up to 1.50 m do not affect the mobile printer. Connect either with a cable using the USB or RS232 interface, or optionally via Bluetooth and Wi-Fi. Based on the Honeywell programming language Fingerprint, you create individual applications according to the requirement.